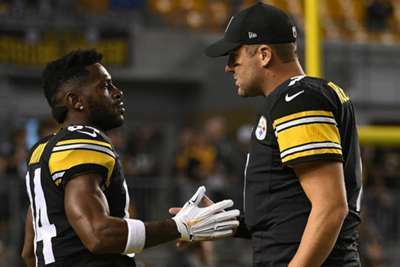 Pittsburgh Steelers star Antonio Brown says his connection with quarterback Ben Roethlisberger is always there, despite how spotty it can be. Brown – a six-time NFL Pro Bowler – has 29 catches through four games, and is short of his career average recording 9.4 yards per catch. He has zero 100-yard games after ending last season with 14, and only three touchdowns. None of this worries Brown, however. "It's like Wi-Fi, you know," Brown said of his connection with Roethlisberger. "Sometimes the connection is poor. "Sometimes the connection is great. But it's always connected." Brown is second behind receiver JuJu Smith-Schuster, who leads Pittsburgh in receptions (31) and yards (416). Smith-Schuster has four less targets than Brown (38) and has said he has benefited from double coverage opponents have been giving his teammate. "We will make our plays," Brown said. "We just got to find a way to get this thing rolling." The Steelers will host the Atlanta Falcons on Sunday.